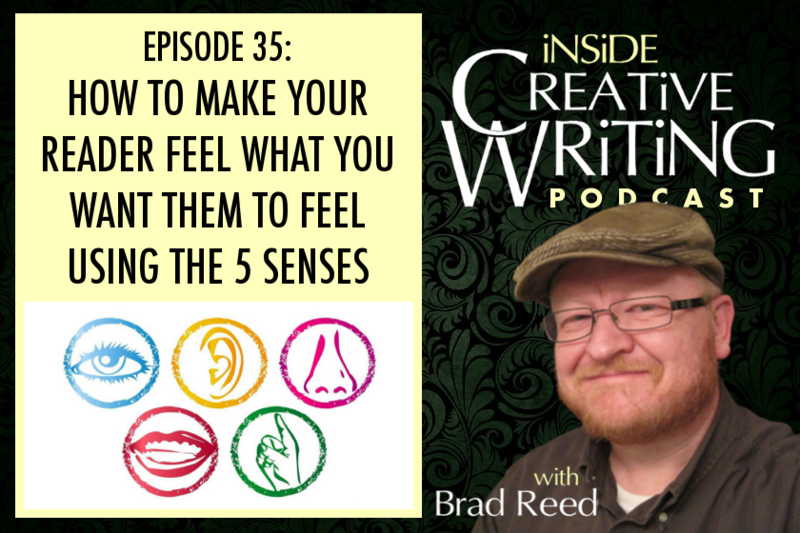 Episode 35: How do you get your reader to really FEEL what you’re trying to get them to feel? It’s the opposite of what you might think. Today we explore the importance of writing from the senses. As I mentioned in the intro, today’s show idea comes to us from writer Alan Heathcock and a resource he shared with us way back in Episode 6. As he was finishing his award-winning collection of short stories called VOLT, he codified his collection of writing advice into what he called the “27-Tenets-of-Fiction-Writing.” One of them that stood out as particularly interesting, though, was Tenet #7 which reads: FEELING is communicated through the senses. Communicate through images, sounds, scents, and textures, not through words. You will primarily communicate through images. I think this is one of his most insightful tenets for a couple of reasons. First, if we’re not trying to communicate feelings to our reader, then what are we really trying to do? Get our reader to FEEL something should be the highest purpose of our art, shouldn’t it? And secondly, I think he points out how we go about trying to get our audiences to feel entirely backwards. I’m going to try to boil Alan’s wise words here down to even more simple language so we can begin to get our minds fully around what I think he’s saying here: Emotions are transmitted to readers through the five senses. He seems to be suggesting that it is not through clever or overwrought plot lines, not through lines of dialogue or seeing the furrowed brow of a character. Those elements play a role, for sure, but they are not the part of writing that is doing the heavy lifting when it comes to emotion. Rather than explore what is being claimed here from an academic standpoint, I’d rather tell you about an experience I had a few days ago with my Creative Writing class. I had been thinking about this concept of transmitting emotion through the senses and ended up kind of making up a writing activity on the spot that actually worked really well to illustrate the point. Here’s what we did. I took my class in to observe another class in progress. They were playing some kind of Pictionary-type game so it was a little chaotic, but those kinds of environments are nice for this kind of writing. Then I simply had them write for five minutes about what they saw, what they felt, what they heard, what they tasted (if anything! ), and what they smelled. Basically it was a five senses exercise. They couldn’t write a story, couldn’t create characters, couldn’t do any of that. They were just recorders of the details they experienced in that place for that period of time. After writing for awhile, we came back to the classroom and I had them switch papers with another classmate and pretend that they had just found this writing on the ground somewhere–like they no longer knew who had written it or where they had been. Their assignment was to read the description and try to infer what kind of emotion the writer was experiencing or what kind of mood the writer was in when they had written it. I didn’t know what to expect from this little experiment, but the results were pretty profound, at least for me. I traded my writing with one of the students and what I found was not just a list of details. I mean, it WAS, because that’s what I’d asked them to do, but, in the process of reading and interpreting it, it became something different. It became a STORY with a full range of emotional experience. She started out describing the students as “bright-eyed” with their “minds alive.” It felt very positive and upbeat, and I started to build this character in my head–someone looking on the bright side of life and feeling very positive. An upbeat person. But then, almost immediately, the tone changed. Suddenly she was focused not on the group as a whole but on one particular student who was off by themselves a little bit. The mood I assigned to the writer shifted a little bit. She wasn’t completely happy and positive. Something about her had drawn her attention to this solitary student and I began to understand the writer as perhaps a bit lonely herself, simply because that’s what she had noticed in the room. The next description was of the desks creaking and the chalk drawings “crumbling” off the walls. These two loaded details, creaking and crumbling, felt decidedly negative, especially with all the positive things that were probably around that she could have focused on. The chalk drawings, after all, are very bright and vivid and fun, but she noticed the way the chalk was crumbling off of the board and collecting on the floor. As the mood and emotion of this character I was building in my mind, I naturally created a story around her. This was not someone who was simply just bright and bubbly. This was someone desperately TRYING to see the positives of the world around her, but was constantly being pulled back into the darkness because of whatever she was going through at the time. The really cool part is that, when I talked to the writer about this afterward, she told me that I was dead-on right about her emotional state that morning. Simply by listing details–what she noticed first and the particular words she chose to describe it–she was giving me a window into her emotions. She didn’t have to come right out and tell me how she was feeling, but she basically did simply by showing me the world as she saw it. In fact, if she HAD told me how she was feeling, I probably wouldn’t have “heard” it as loudly as I did by being able to put myself in her shoes and see and experience what she was seeing and experiencing. And I was fully engaged in the process as a reader. If she had announced her emotional state at the beginning of her writing, I would have disconnected from it because there was no longer a puzzle to solve, and these kinds of little subtle puzzles are exactly what readers come to books to experience. They want to play a role. They want to figure things out and put things together. They want to be able to discover for themselves how someone feels by the way they are viewing the world and the things they are paying attention to. It’s a powerful kind of magic that only exists in writing prose. You don’t get access to this kind of thing in film or plays, or at least not to the same extent that writers of prose do. So here’s the hack. Here’s how to use this in your writing. Or at least here’s how I’m using it in mine. Maybe it works for you and maybe it doesn’t. When I’m drafting, I often purposefully write really terribly. I know that the detail work of a story requires more intense, slow, methodical thought that I can give as I’m just getting the bare bones of an idea down on paper. It’s common for me to write something terrible like “Mike was angry about what Martha said” or “Phil was feeling disconnected from society.” Sentences like these will never see the light of day, of course. Their doing all the work for the reader and leaving them entirely passive, and that’s when readers disconnect and put your book down. But I’m really doing is leaving placeholders for me to go back and fill during revision. When I’m revising and rewriting, and I come across one of these heavy-handed announcements of emotion, I know it’s a sign that I have to slow down, put myself in the shoes of that particular character, and spend some time seeing the world and the setting the way they would see it. Would this character, who is feeling lonely and isolated, notice the vast blue sky overhead, or would they instead focus on the single tree left standing in an area of clearcut forest. You don’t even have to say something like “he felt as lonely as that isolated tree left standing in a swath of clearcut forest.” Your reader is smarter than that. They’ll do the work of interpreting how that character is feeling simply based on what he or she noticed. Now, they won’t do this consciously, but none of us really do. But we’re hardwired to solve little puzzles like this. We get a little boost of adrenaline every time we do. We’re doing it constantly in our real worlds and can easily bring those same skills to bear in a work of fiction. I recommend you actually try this little game and see what you learn from it. You don’t really even need more that one writer to do it. Just go somewhere where there are people around or things are otherwise interesting, and write what you see as descriptively as you can. Don’t try to tell a story or be overly emotional. Just document. Then ask someone–anyone–to read it and infer what mood the writer is in. They’ll be able to do it, and you’ll discover the way seemingly innocuous, tiny details can be interpreted with real emotional impact and weight. And the key here is in the details. Get away from talking about what everybody sees… the sky, the clouds, the grass, the road. Live in the tiny things. Live in the things that ordinary people don’t necessarily notice as they go through their day. These are the things that hold real power in your reader’s mind. These are the things that will cause them to stop and wonder why the character noticed THAT particular thing out of all the other possibilities. Again, they won’t consciously stop and put your writing down and scratch their chin in thought, but the little synapses and puzzle-solving areas of the brain will be firing on all cylinders to put it together under the surface. Your readers brain will be buzzing with ideas and inferences and they’ll be hooked. A word of warning here, and I think it’s something I mentioned briefly in a recent episode, is to be careful not to get caught up in a single sense. We’re very visual beings and, if we’re not careful, we can write like it’s the only sense we have. If you’re a screenwriter, you’re really limited in this sense, although you have a lot of opportunity to bring in audio details as well. Don’t forget that we are tasting, smelling, feeling, hearing creatures just as much as we are seeing ones. Work all the senses into your writing and immerse your reader in the setting that your character is experiencing so that they are right there alongside them. Okay, one more word of warning about all this detail stuff. Watch out for cliche here. It can be really easy to slip into describing other senses with cliches. We want to bring in a smell so we end up saying something like “the air smelled like fresh flowers” or “his breath smelled like a grave.” We naturally reach for cliches when we are writing because we’ve heard them so often. Everybody can think of them because they are so common. Keep digging for that angle that nobody’s heard before. Create that moment in your reader’s mind where they have to “wake up” to your description and experience it anew because you’ve forced them to with a creative, new take on it. And make sure it’s connected to your character’s mood so it’s doing double-duty. Never stop at the first idea you come up with. There’s always something better out there if you just keep digging and trying things out. Even though we get a 3rd person narrator here, because its focused on a single character, Winslow Nettles, we feel like we’re seeing and experiencing the world through his eyes. In other words, we are intuiting his emotions and point-of-view and feeling some of it ourselves. Now the work that Alan is doing here is really subtle–and that’s the point. Anything too heavy-handed starts to feel too obvious and the reader gets the feeling that they’re being played. He starts by describing the the way the dusk “burns” the ridgeline and how the dust “churns” up from the tiller to create a fog. These words, all in the first sentence alone, start to speak to us emotionally. It feels like something’s coming, something serious and ominous. Winslow is apprehensive and moody here. He worried about what is over the horizon, both literally and figuratively. And we see that he is absolutely covered in dirt–a kind of symbol or foreshadowing of death–and then we get an homage to how much this man’s farm means to him. The height of his pride was that he “always brought in dry grain.” Now, I don’t even know what that means, but I don’t have to. The emotion, the pride is there in the words, and it translates to us as the reader. We feel his sense of pride. This is a guy who takes his job seriously but worries that something is coming to ruin it. There are other examples of using detail to evoke emotion in this excellently written opening, but lets jump to the real emotional meat here: the moment that he runs over and kills his son. If this were written as most people would write it, we’d see Winslow break down into tears and rend his garments and the reader couldn’t help but miss the overly-wrought emotion that they were supposed to feel–so much so that they probably wouldn’t have felt it at all. It would have been to heavy-handed and obvious and the reader would put up a wall against it. Instead, Alan shows us this man cradling his dead son in his arms as the tractor runs off without him, still tilling, still working. In other words, his regular life, the one he was so proud of and invested in, just left without him. That’s what this death is for him. The end of everything he loved. None of that is spelled out specifically on the page. It seems like it’s completely lacking in emotion, but it’s actually all there in the details, the images. And Alan has left it to his reader to discover it, making them an equal part in the telling of the story. Truly powerful story telling happens when the reader gets to meet the writer halfway to create meaning and emotion. That’s when a reader becomes part of the story. Just a few short paragraphs but a master class in using the senses and imagery to create an emotional impact for the reader. Let’s hear that tenet once again now that we’ve unpacked it a bit here today: FEELING is communicated through the senses. Communicate through images, sounds, scents, and textures, not through words. You know what? I’m going to go ahead and put a link to Alan’s tenets document again in the show notes for this episode as well just to make it easier for you to find. Head on over to www.BradReedWrites.com and check out his other great insights into what it takes to write great fiction. It’s worth the read! And isn’t that true? What smells take you back in time to a very specific place, around very specific people? For me, it’s the smell of a Marlboro cigarette. I’ve never been a smoker, and almost nobody in my life smoked, but my grandfather sure did. Every experience I had with him was garnished with the smell of a Marlboro cigarette. And the best times I had with him, the times we were the closest, was sitting with him in his fishing boat up on Lake Owyhee in Eastern Oregon. He taught me to put a worm on a hook, cast a line into the water, jig the bait just so, and reel in a shining, shivering crappie all to the smell of a Marlboro cigarette. The smell of any other cigarette starts to make me sick almost immediately, but a Marlboro takes me back to when I was a kid and plants me right next to my grandpa and I’m there fishing with him again. This is the power of the senses. Yes, our sense of sight is vital and maybe even more important in some ways that the others. But the other senses, I think, can more deeply connect us on an intimate level with emotion and experience. Take it from Nabakov and get some great smells working in your novel! Next Post:Episode 36: How to Write Better Dialogue… by not Writing Dialogue!